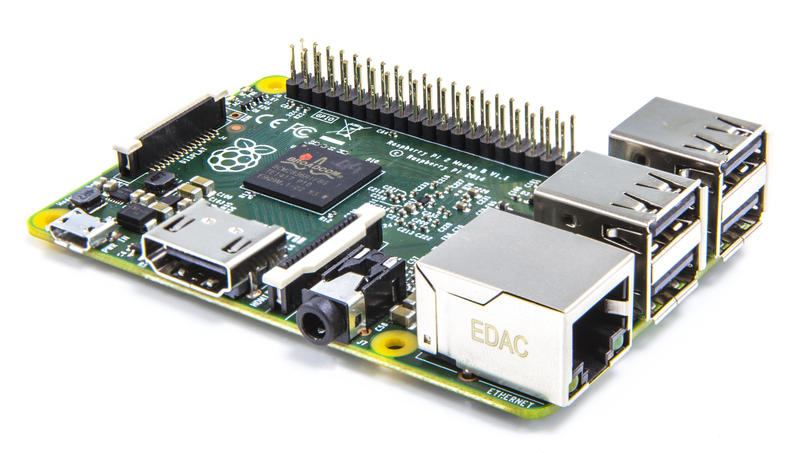 The increase from a single core 700MHz processor to a Quad-core 900MHz beast is impressive by itself but combine with double the RAM the Raspberry Pi 2 model B is a serious unit. So to the fun stuff… As I mentioned I was after a cheap solution to be able to access my various media, movies, music, pictures etc from anywhere in my house (most likely from other ‘Pi’s). The main thing you need is the pi (obviously), many vendors sell them on Amazon at the moment, I bought this one and a power supply (a micro usb phone charger does work but should really be over 1A capable). Additionally I bought a 2TB Western Digital Green hard drive and a USB enclosure, all of which I have been pretty impressed with and will be buying again. You will need a keyboard, mouse and monitor to do the initial configuration (I had these lying around but low cost options are available on the internet) and some way of connecting to the internet. For internet connectivity, while a wireless USB dongle does work in experience I have found this to be an unreliable method of streaming, based on this I would suggest a wired ethernet connection. Will load the desktop if you feel more comfortable in a GUI environment. Now you have a fully functioning Linux computer, it is time to turn it into a NAS! You can now connect your external hard drive via one of the spare USB ports on the Pi, this will likely automatically mount to a path in /media. Examine the /dev/ folder and look for a new entry, this will likely be sdb1 (sdb is the device node and partition 1, if you have a hard drive with multiple partitions this will show up as sdb1 sdb 2 etc). Normally on a Linux system the easiest way to examine what disks are attached is to use the fdisk utility, I haven’t suggested the use of this as it didn’t work on my pi with my hard drive. And you need to add the following line. The first argument is the device node wishing to be mounted, the second is the location which it will be mounted, the third is the filesystem type (this can vary but being a windows user I tend to format large disks as NTFS). These are fairly standard options and provide general use, but you can customise it to suite you and add additional folders/shares for other hard drives as required. After this last command you will be prompted to enter the password for the new user as well. The Pi will reboot and from another computer you should be able to view and access it by browsing your network. Trying to access it will prompt you for your username and password, this will be for the user you created previously. Existing files should be viewable and editable. Personal experience I have managed to simultaneously stream three movies one to a ethernet connected computer and two wirelessly around my house without issue or breaks. The only thing I have encountered so far was streaming a 3 gig movie file had to buffer a little bit in the first few minutes but then played without issue. I am planning on expanding this to 3 external Hard drives with different media and a software RAID options.. stay tuned!